Artwork of a Sneek from Donkey Kong Country 3: Dixie Kong's Double Trouble! Sneeks are enemies that appear in Donkey Kong Country 3: Dixie Kong's Double Trouble! and Donkey Kong Land III. These big rats replace the Gnawties of Donkey Kong Country and the Neeks from Donkey Kong Country 2 as the game's short weak rodent enemy. 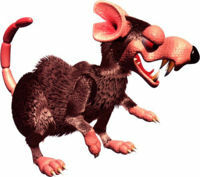 In the game, they are depicted as indigo-furred rats, yet the Sneek in the artwork shows a more maroon fur. Compared to Neeks, Sneeks have more menacing faces, as well as a less cartoonish anatomy. They also have a more battered appearance, due to having notches on both ears. They can be defeated by any attack, so they are not a real threat. They can be found in all kinds of locations, such as mills, forests, jungles, or mountains. According to the game's credits, Sneeks belong to the "Terrorfirma Tuff Guys" enemy class. Sneeks play an important role in the level Squeals on Wheels, which takes place inside a mill in Kremwood Forest. In this area, many Sneeks are running around in large wooden wheels. In order to open the doors in their path, Dixie Kong and Kiddy Kong must take out all the rats by tossing Steel Kegs at them. A notable feature is that Ellie the Elephant will get spooked if she sees a Sneek, causing her to run in panic. In Murky Mill, the fifth level of the game, most Sneeks are too hard for her to see because of the darkness, unless they walk directly under the lights. In this case, Ellie must take care of the rats by tossing Barrels at them from a distance. An entire Krematoa level, called Stampede Sprint, also revolves around this: near the beginning of the level, Ellie will be frightened by three Sneeks, making her to stampede through the jungle. Ellie is not scared of Sneeks in Donkey Kong Land III, although this is likely due to system limitations. Sneeks appear in the following levels. In the Game Boy Advance remake of Donkey Kong Country 3, Sneeks have the same sound effect as the Neeks from Donkey Kong Country 2, while in the original game, the sounds are sped up and higher-pitched. This page was last edited on November 21, 2018, at 12:20.